information about pick your own farms we think your family may enjoy. This article was published in 2013. For current information about DiMeo Fruit Farm and all that they offer, please contact the farm directly. Growing up, going to pick fruit with my family was always something I looked forward to. Since I’ve moved to New Jersey and had kids, visiting Pick-Your-Own farms has become a tradition for us as well. We’ve picked a lot of different fruits, but recently took a road trip to Hammonton, New Jersey to pick blueberries from DiMeo Fruit Farms and Berry Plant Nursery. I can honestly say I’m officially hooked on this place. Did you know that Hammonton is the Blueberry Capital of the World? We had so much fun picking blueberries at DiMeo Family Blueberry Farm in Hammonton, New Jersey we forgot to stop to take pictures. Maybe I’m showing my country girl side, but to me, there’s nothing better than hitting a field in the hot sun and filling up a container, or several, with berries. There’s just something about blueberry picking that’s good for your soul. We visited on July 5th. The sun beat down and my kids raced through the aisles and aisles of blueberry plants through the sprinklers getting soaking wet and squealing with excitement while I picked blueberries. They took a break every once in awhile to sit down and eat blueberries directly off the plants, being careful to only pick the dark blue ones, as another picker had taught us. We left with 5 pints of absolutely delicious, fresh, non-GMO blueberries for $10, an afternoon full of memories, and an energized exhausted feeling that comes from spending a hot summer day out in nature with your kids. There’s plenty of research out there about the health benefits of blueberries. I’m no expert- but I know they’re an excellent health food and yummy snack. My family simply can’t get enough blueberries. We picked 5 pints ate them in a week. I’m planning a second trip to get some to freeze. Blueberries are a great snack food for kids. Plus, they freeze easily and there are so many uses for blueberries. 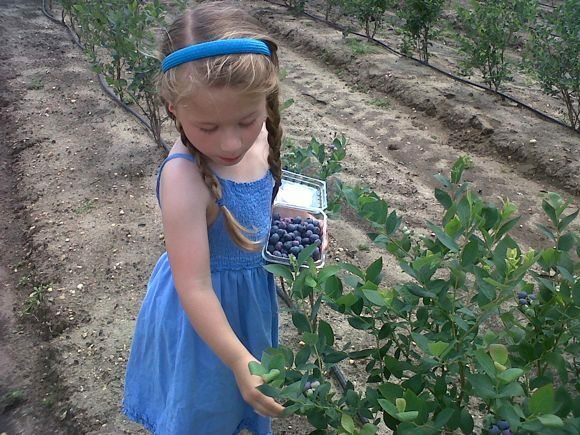 Picking your own blueberries is a great family friendly activity and a way to teach your kids about agriculture and science. Not to mention a great way to enjoy a day outside together. Business hours are by APPOINTMENT ONLY, Monday thru Saturday (10am to 5:00pm) and Sunday (1pm to 5pm). Make sure you call to let them know you are coming. The blueberries available at the Pick Your Own farms are “better tasting” blueberry plant varieties such as Heirloom blueberry bushes with large sweet blueberries that are available from June through August every summer. While you are there to pick blueberries, take a walking tour of the DiMeo’s gorgeous new Agritourism farm and nursery or pick out some blueberry plants to grow at home. Bring cash. If you forget, there is a small convenience store with an ATM right down the street. Blueberries are purchased by the pint, and DiMeo provides the containers. If you’re interested in purchasing blueberry plants, they will guide you through the process and answer any questions you may have. Weddings and Events at the farm center in the heart of the New Jersey Pine Barrens, surrounded by beautiful tall 80′ foot cedar trees around a blueberry farm. I love a good story about a successful family business and DiMeo fits the bill. They are in their 4th generation and operate many acres of family-owned blueberry farms and non-GMO berry nurseries in Hammonton, NJ. They are experts when it comes to blueberries. After all, they’ve been farming blueberries in the ‘Blueberry Capital of the World’ for over 100 years. If you want to know more about growing blueberries, visit their website or Facebook Page to read about blueberries and watch their YouTube Videos. When we arrived, I was a little frazzled and feeling unprepared since I’d decided to go picking at the last minute, traveled an hour, and accidentally put the wrong address into my GPS. However, they were so friendly and helpful my mind was immediately put at ease and we had a fabulous day picking blueberries together. So friendly, in fact, that my 3 year old spent a good chunk of time asking everyone questions. Just awesome people. People come from all over the country to purchase blueberry plants and pick their own blueberries from them. The blueberries were large, delicious, and easy for my kids to pick. Groups of six (6) or more adults can pack a lunch and enjoy a free picnic in their picnic areas under the tall cedar trees along the blueberry fields in the heart of the New Jersey Pine Barrens after picking. Call us at: (609) 561-5905 for more details. I loved our experience picking blueberries so much, that I’m planning to bring a group of friends later this month. This post was sponsored by DiMeo Fruit Farms and Blueberry Plant Nursery. However, all opinions and our experience picking berries there is 100% our own.